Allied male bottlenose dolphins swimming together. The life of a bottlenose dolphin can be surprisingly rough, with individuals chasing, biting, and smashing themselves against each other in the struggle for social dominance. Sometimes, males form long-lasting alliances with each other to gain an edge, but as new research shows, not at the expense of losing an indelible aspect of a dolphin’s identity: their own unique name. Dolphins make all sorts of noises, like burst-pulses, clicks, and whistles. Some of these sounds are used for echolocation or conveying mood, but they’re also used by dolphins to call out to each other by name. Marine biologists aren’t entirely sure how each dolphin gets their name, but a distinctive “signature whistle” emerges within the first few months of life, and it sticks. Research done a few years back, for example, showed that signature whistles among wild female bottlenose dolphins remained stable for at least 12 years, pointing to the social importance of names amongst this species of dolphin. Both male and female bottlenose dolphins call out to each other by name, but among the males, these names have an added importance, as new research published today in Current Biology shows. A trio of allied male dolphins hanging out. Male bottlenose dolphins form cooperative groups, or “nested alliances,” to pursue and defend their access to females. Previous studies have shown that these relationships often last for decades, and they’re a critical aspect of a male’s reproductive success. In Western Australia’s Shark Bay, for example, males cooperate together in first-order alliances consisting of two to three individuals. Together, they “herd” and control the movements of a single female (we’ll spare you the unpleasant details, but more information about this sexual behavior can be found here). But second-order alliances exist as well, which consist of four to 14 males. Second-order alliances are considered the core unit of male social organization—a group that works together to gather and defend females. For the new study, King and her colleagues sought to determine if vocal cues and signature whistles play a role in coordinating complex social behaviors among male bottlenose dolphins, including cooperation. 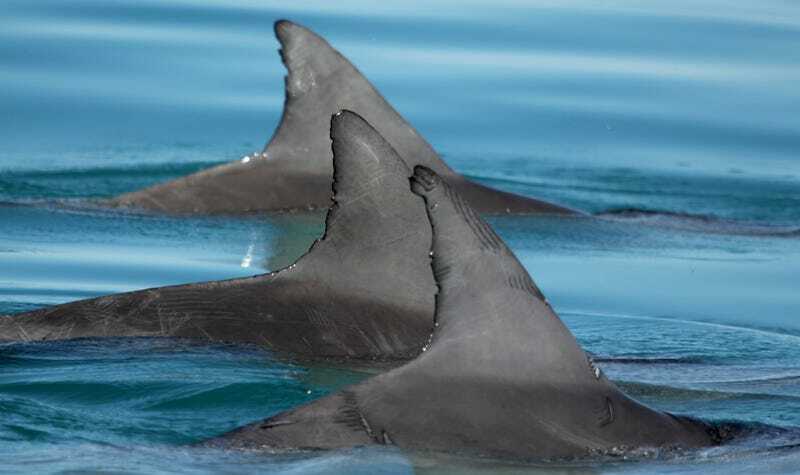 One possibility, as suggested by a 1999 study of dolphins at Shark Bay, is that allied males drop their names in favor of one shared whistle type. Another possibility is that dolphins assign nicknames to each other, or adopt names that sound similar. But as the results of the new study showed, this isn’t the case. Males within these gangs retain their individual names, and don’t share a common call, akin to a secret password, with their cooperative chums. To figure this out, the researchers took a closer look at the bottlenose dolphins in Shark Baby—a population that’s been studied steadily for the past 30 years. By using underwater microphones and long-term photo-identification records, the researchers identified the signature whistles of 17 adult males, who together comprise six first-order alliances across three different second-order alliances. After meticulously scrutinizing each call, the researchers found absolutely no variations in the names used by the allied males. This suggests male dolphins in tight partnerships don’t just suddenly change their names, as was previously suggested. Naomi Rose, a marine biologist at the Animal Welfare Institute in Washington, D.C., liked the new research, saying the authors did good work and that their methodology was impressive. For Rose, who was not involved in the study, the upshot of the paper is that dolphins have names and they don’t change their names just because they hang out more with certain other dolphins. This result, said Rose, emphasizes that dolphins are self-aware and individualistic, rather than interchangeably part of a population or group. “They are individual beings with individual minds,” she said. Rose also found it interesting that the new study contradicted the results of the 2004 paper, which was a study of the same population. But as King and her colleagues note, this is likely because the previous study used a very small sample size, the researchers only looked at first-order alliances, and the alliance formed under abnormal circumstances (the dolphins hung out on a shallow beach where humans regularly fed them with fish). The new study offers some fascinating insights into dolphin behavior, but the next phase of the research promises to be even better. The researchers plan to play the recorded signature whistles of each individual male back to each other to see how each male will respond depending on the context. It’ll be a while before we truly understand the nuances of dolphin communication and behavior, but we’re getting there one click, burst-pulse, and whistle at a time.